Behind this blurry photo is a heartbreaking story. If you live in West St. Paul or the West Side, odds are pretty good you’ve been approached by two teenage boys with a tattered flyer seeking donations for their basketball team. It’s a frequent topic of conversation on the West St. Paul Neighbors Facebook page, with people spotting the duo going door-to-door in residential neighborhoods or soliciting customers at businesses along Robert Street, at times getting belligerent with anyone who doesn’t give them money. They finally arrived at my door this week. They gave me a mumbly story about how their basketball team’s trip to the Bahamas was canceled and they need to raise money. I asked if there was an address or phone number for the organization so I could give directly, maybe mail in a check. Oh no, they said, I could only give cash directly to them. 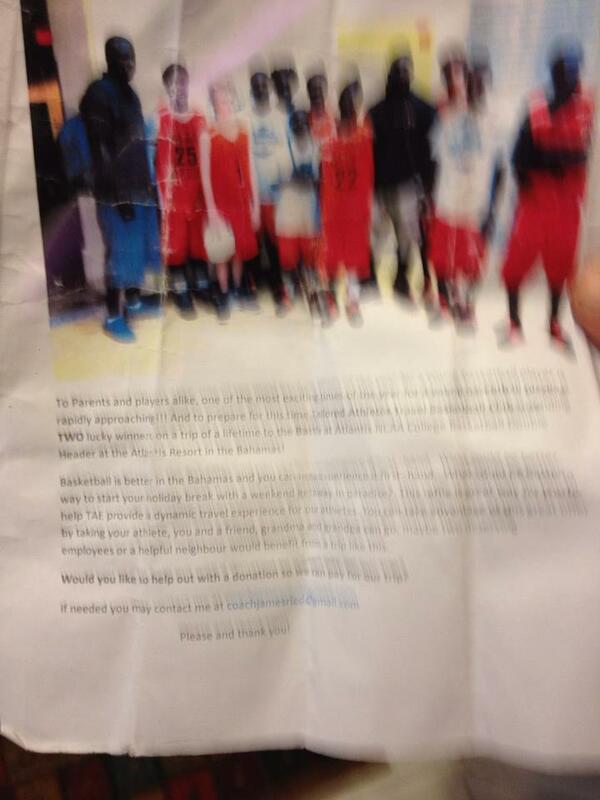 I managed to snap a photo of the flyer (yes, it’s blurry, sorry, I was trying to be subtle). You can make out an email address for “coachjamesried@gmail.com”, which if you run through an online verifier, comes back invalid. Also, the flyer lists an organization called “Tailored Athletes” – as far as I can tell no such club exists locally, although there is a Taylored Athletes based in Boca Raton, Florida. So! The flyer and the story are most assuredly fake. Based on that along with what I had heard from others’ accounts, I called the cops. An officer from West St. Paul police responded within a few minutes, but couldn’t find any sign of the two boys. He told me the police were very familiar with this pair, and had even talked to their parents, who defended the kids and claimed the basketball fundraising story was legit. The cops, however, ain’t buyin’ it. But wait. Why am I writing about this? Why, just tonight, police were after someone breaking into garages over by Cherokee Park. In the scheme of things, grifting people out of a few bucks isn’t that big a deal. But the reason I care, and the reason you should care, is that these are kids. The adults in their lives – who are either in on the scam or in denial about it – are failing them. We have a moral duty to intervene. If they’re out on the streets every day learning that crime pays off, it’s only a matter of time before they’ll be breaking into your car, or worse. The officer that responded was very thorough and asked me to help alert neighbors as to what’s going on. So if you are approached by two teenage boys with the flyer pictured above, don’t hesitate to call the police. It may be the best thing you can do for these kids.